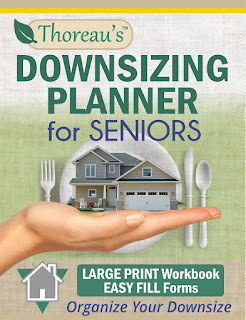 Thoreau's Downsizing Planner for Seniors' is well thought out and thoughtful throughout! You will find questionnaires, forms, and worksheets for finances, deciding what to keep, toss, donate or sell. You can track your move from start to finish with tips on how to keep records safe and everyone you need to notify for an address change. Yep... this planner covers downsizing completely.